This paired poetry and short story lesson is designed inspire your students during standardized testing time – or anytime of the year they need a “pick me up”! 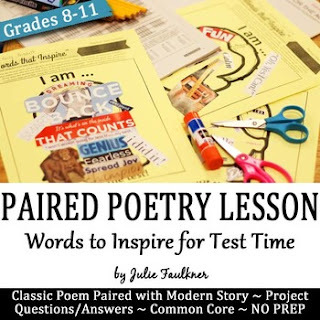 The questions are designed to guide the students through an understanding of the poem and the short story independently, but also to synthesize meaning across the two texts. The final project allows students to express themselves in a creative and concrete way so as to realize they have so much to offer beyond the realms of standardized testing – they are not the test! Anchored with a poem by Edgar Albert Guest and paired with a modern story from the Chicken Soup for the Soul books, students will be close reading classic poetry while learning to think positively about themselves. They will finish the lesson with a creative project that solidifies what they've learned about the meaning of success - and to remember they "are not the test"! Perfect for a downtime day or just as a quick review before, during, or even after testing while you are waiting for scores. All the work is done! Just print and go! Find other resources for promoting positivity during test time, too!